So, if I could have any pet I wanted, I'd want a whole herd of polar bears. However, I'm sure something like that would require very specific zoning laws and whatnot. So, in the meantime, I'd want a whole pack of dogs. Granted, my apartment's a bit small, so I should probably stick to just plants for the time being. 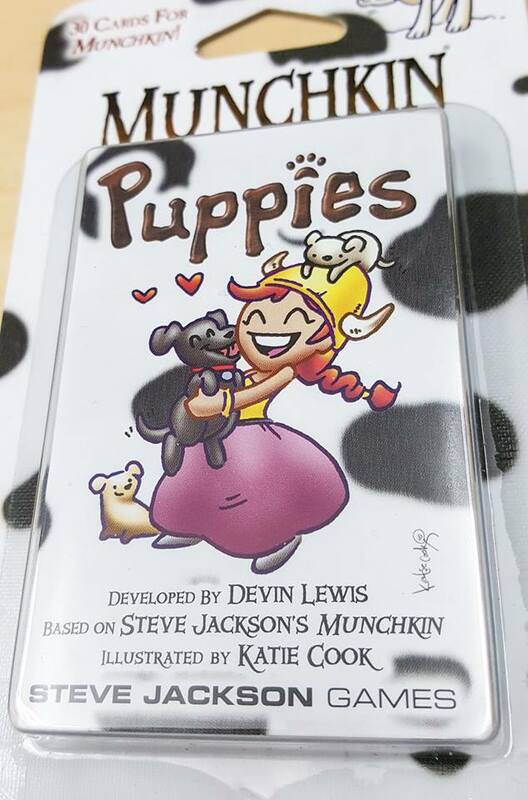 However, I can now bring a whole pack of puppies to my Munchkin games (or, I will be able to soon), and I might be able to do it for free, if I'm lucky. The new Munchkin Puppies set will bring you 30 new cards to add to your decks. The set is due out this spring, but you can get an advance copy early. Just go to the Steve Jackson Games Facebook page and comment and share their post. One lucky winner will get puppies! ... Well, a pack of Munchkin Puppies, anyway. They're going to pick a winner this Friday.